I Bought the Bike In November 2001. It Has Had Both wheels rebuilt with genuine Honda Spokes, genuine levers and cables, and I found an NOS airfilter and cage for it also. The Full bike has been resprayed although the tank is still dinted. It had blue Koni rear shocks, but has now been fitted with brand new Falcon black/gold items. The seat has been recovered and it also has an NOS barrel and piston. The paint is flaking off the Berrel but I have some High Temp Brake Caliper paint to finish the engine off. 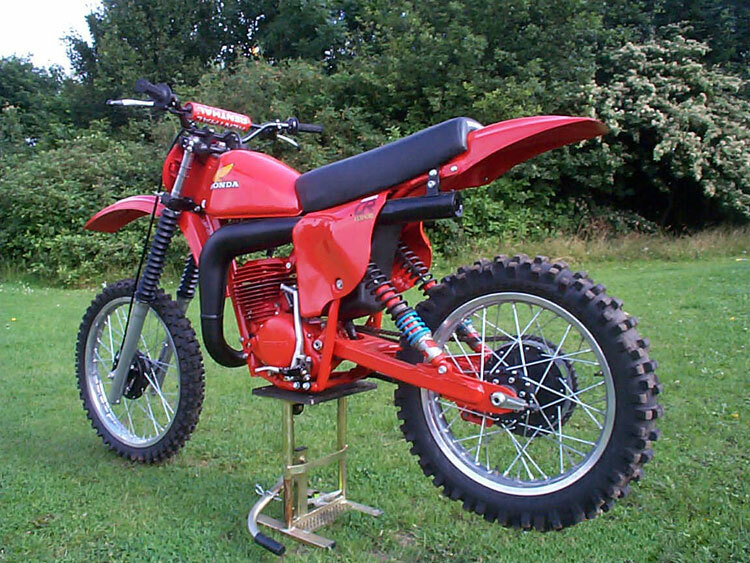 I wanted a "REDROCKET" from about the age of 10 in the late seventies when they first came out, but it took me nearly 25years to find the one I wanted. I bought it from a friend who imported it from America with lots of others. He had one of every year 250 and 125 from '74-'82, but has now sold them all. I was very suprised at how nice the bike was to start and ride, as at the time I was riding modern MX bikes and it didn't seem to have any major differences. I was expecting a much harsher ride and power delivery.